HTML5 Fixes and Optimizations in v4.4.3.2000 for PC! 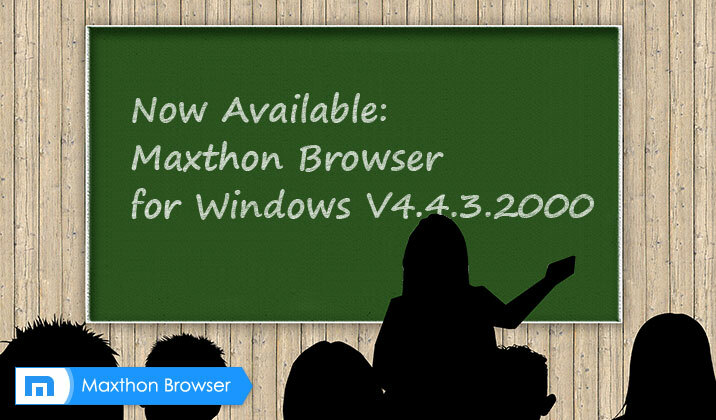 Today, we are happy to let you know that Maxthon Version 4.4.3.2000 is available for you to try! Please try out this final version and let us know what you think. Feature guidence center on start up. *Sometimes switching Languages Spell check is not effective. *Spell check does not work for some languages. *Webkit core does not support document.load sufficiently. *Optimized the support of download file names with special characters. *After switching user account, the account panel would still display the previous account information. To better and more efficiently solve the problems you meet during the usage, for any suggestions or bug reports, we do hope you may go to ‘Product Support ‘ area and report/describe by a new separate thread for each problem/topic. We will read each thread and update the follow-up status then. Meanwhile, some problems are probably be left out if they are stated in other thread. Introducing Maxthon Cloud Browser v4.4.3.600 Beta! 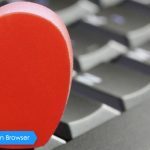 Maxthon Browser MX5 Beta V5.0.1.500 Officially Released! 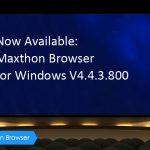 Maxthon Cloud Browser for Windows V4.9.4.200 Officially Released! 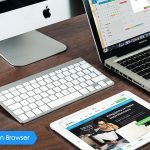 Maxthon Cloud Browser V4.4.1.3000 is officially released! Maxthon Cloud Browser for Windows V4.4.5.3000 Officially Released! When is an update for the OS X version coming?